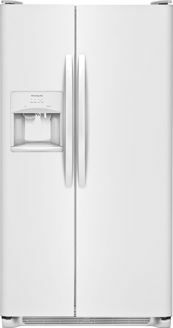 The 36" Side-by-Side Refrigerator from Frigidaire will be the best addition to your place. The unit features a spacious 25.5 cu. ft. capacity to store any sized goods. Store-More™ Gallon Door Bins Door storage gives you room for larger items like a gallon of milk. Wire Freezer Shelves Gives you a way to organize items in your freezer better so you can find food quickly. LED Lighting LED lights illuminate contents within the refrigerator without creating excess heat.